Hike or backpack a thirteen-mile adventure on this view-packed stretch of the Appalachian Trail, exploring Blood Mountain, Neels Gap, Wolf Laurel Top, and Cowrock Mountain. 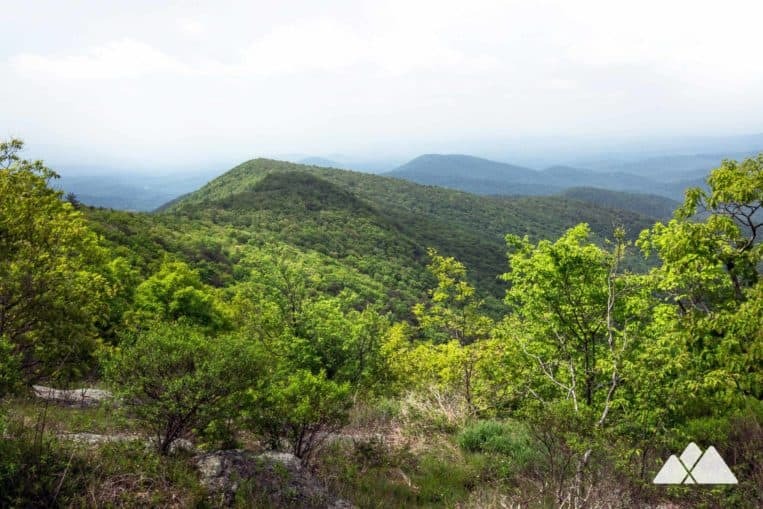 The Blood Mountain Wilderness is one of Georgia’s most popular destinations for outdoor adventure, offering awe-inspiring views from towering mountain summits and trails through lush forest speckled with rocky outcrops. This hike combines several of Blood Mountain’s most popular trails, trekking to the base of Blood Mountain from Neels Gap on the Byron Reece Trail before hiking the Appalachian Trail eastbound to stunning views from Cowrock Mountain. This classic Georgia Appalachian Trail hike racks up 13 moderately difficult out-and-back miles, and scales multiple view-packed mountain summits, scoring views of nearby Yonah Mountain. It’s a fantastic, long day hike – and it’s an even better overnight backpacking trip, with many trailside camping options (including our favorite campsite at the Wolf Laurel Top summit). And if 13 miles doesn’t cut it, there’s more mountaintop beauty waiting at the Blood Mountain summit, a 3-mile addition to the hike from Flatrock Gap. 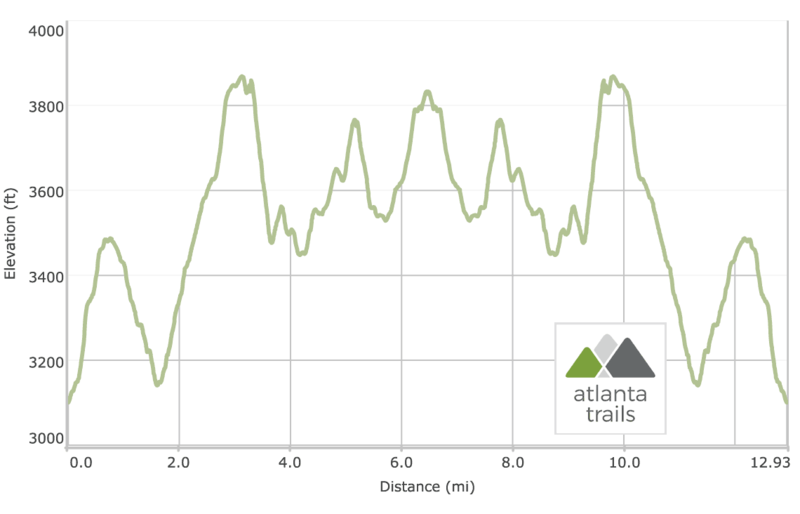 The adventure begins at the Byron Reece trailhead (view trail maps & directions), following the blue-blazed trail through a lush, mossy, creek-filled valley. The trail grabs elevation, ascending through a deciduous and rhododendron forest, following and crossing several small streams in a southwest-bound hike to the AT. Before following the AT’s iconic white blazes through a breezeway in the building, stop at Mountain Crossings, North Georgia’s renowned AT outfitter. Mountain Crossings is one of only a few outfitters located on right on the trail along its epic, 2000+ mile stretch from Georgia to Maine. Be sure to drop in; knowledgeable, friendly, and seasoned AT hikers staff the store. Departing Neels Gap, the trail ascends steadily from the highway, leaving the buzz of civilization behind as it hikes eastbound towards Tesnatee Gap and enters the Raven Cliffs Wilderness. The trail continues its ascent, carving through switchbacks and passing trailside campsites in a 700+ foot climb to Levelland Mountain. The AT crests at the Levelland Mountain summit at 3.15 miles, catching views of the nearby rolling mountains. The Appalachian Trail descends Levelland Mountain, switching back in a descent towards Swain Gap. The trail rolls elevation over Turkypen Mountain and Rock Spring Top, passing trailside campsites on both sides of the trail. The hike follows a rolling ridgeline under a shady forest canopy, passing through a green, fern- and wildflower-filled forest. The trail begins a steady ascent to Wolf Laurel Top Mountain at 4.25 miles, reaching the summit at 5.1 miles. A side trail departs trail right, looping to a prime campsite at the mountain’s summit – one of our favorite on the Appalachian Trail in Georgia. The views from the campsite are stunning, especially at daybreak, when the sun rises from the far horizon in a stunning, colorful sunrise. The hike departs Wolf Laurel Top, descending to Baggs Creek Gap at 5.75 miles. The AT climbs from the gap, grabbing elevation in a final climb to the Cowrock Mountain summit. 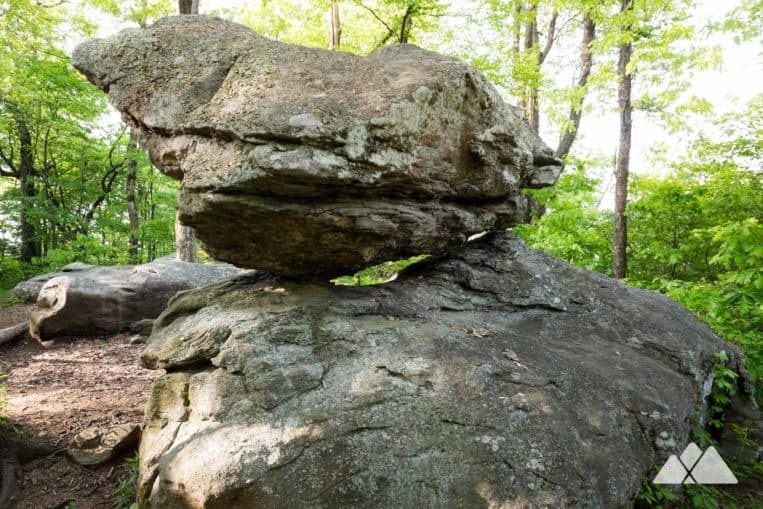 The hike catches views from a rocky clearing alongside the Appalachian Trail at 6.2 miles before reaching the Cowrock summit at 6.5 miles. The summit offers stunning views of the surrounding mountainscape, notably more angular and pronounced than the rounded, rolling scene from Blood Mountain to the west. Yonah Mountain is visible on the near horizon, its sheer walls of nearly-bare rock towering skyward. From the summit, the Appalachian Trail hikes .85 miles to a paved trailhead at Tesnatee Gap. This hike turns from the Cowrock Mountain summit, retracing the Appalachian Trail westbound toward Neels Gap and Blood Mountain. The hike scales Wolf Laurel Top and Levelland Mountains before crossing Neels Gap to return to the Byron Reece Trail. 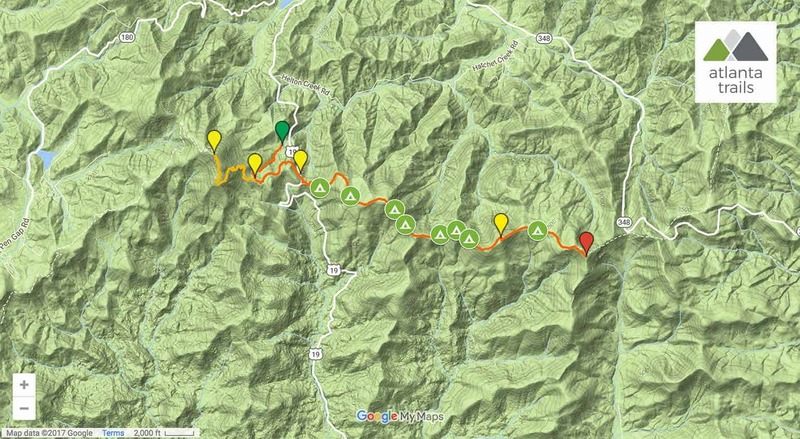 The hike turns right on the Byron Reece Trail at Flatrock Gap, descending to the trailhead and completing the hike at 13 miles (or 16 miles, with the Blood Mountain summit extension). This stretch of the AT offers fantastic camping opportunities to backpackers willing to haul their gear over the hike’s many mountain ascents (free, first-come, first-camp). The Wolf Laurel Top site is our top pick, and one of our favorite backpacking campsites in Georgia. If that spot is already occupied, catch some dreams under the stars on the AT at one of the many other campsites on the trail – check out the trail map below for campsite locations. 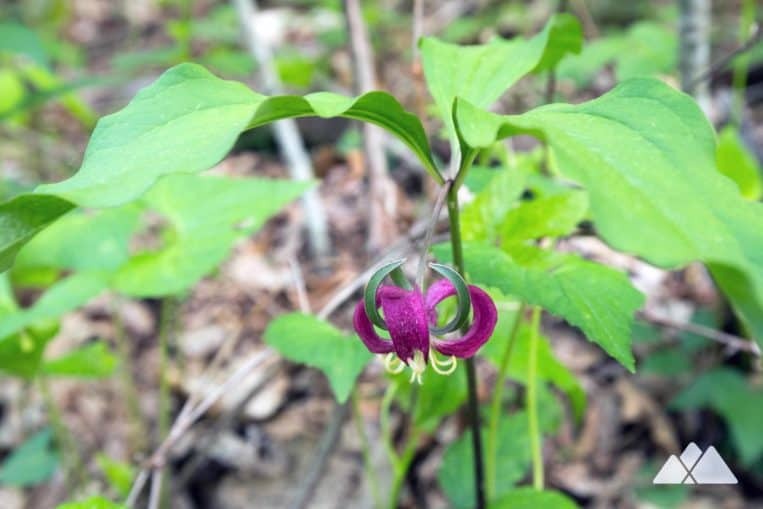 This hike explores both the Blood Mountain Wilderness and the Raven Cliff Wilderness areas. Due to their popularity with hikers and backpackers, both of these wilderness areas have seen increased black bear activity at campsites in recent years. Storing food in bear-resistant canisters is required March 1 – June 1, and strongly suggested year-round. And campfires are prohibited year-round in the Blood Mountain Wilderness.